​The love of music has been passed down from generation to generation since the founding of the church. This musical heritage no doubt has its origins in Germany and Russia where the founding families had ancestral ties. In 1945, Louis Pilbeam was invited to begin a band at our church. Trumpets, trombones and saxophones were the basic instruments. As soon as a student learned to play the scales, Mr. Pilbeam taught them to transpose piano music from the hymnal. Church band members, who actively participated in the church services, discovered when they entered high school that they were considered among the best musicians in their school. Many band members were top musicians in All-City bands, orchestras and the Junior Symphony. Small groups provided music for banquets, youth meetings or wherever they were needed. The band was often invited to perform concerts at other churches, even as far away as Vancouver, British Columbia. 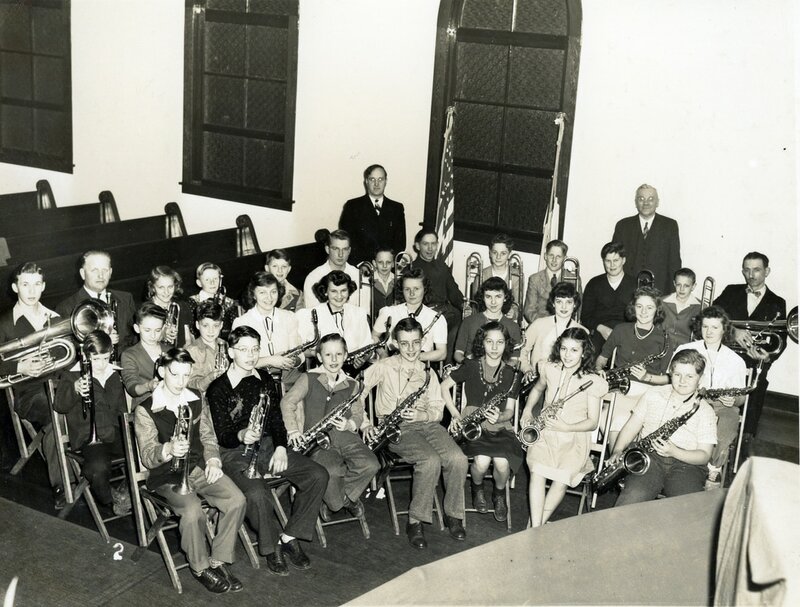 Second German Congregational Church band circa 1945. Rev. Heinrich Hagelganz is standing to the right and Louis Pilbeam to the left. Harold Kammerzell is seated at the far left of the front row holding his trumpet. Photograph courtesy of Harold Kammerzell.